One of two new releases this month from Kartemquin, Raising Bertie continues the company’s long tradition of socially conscious vérité documentaries. 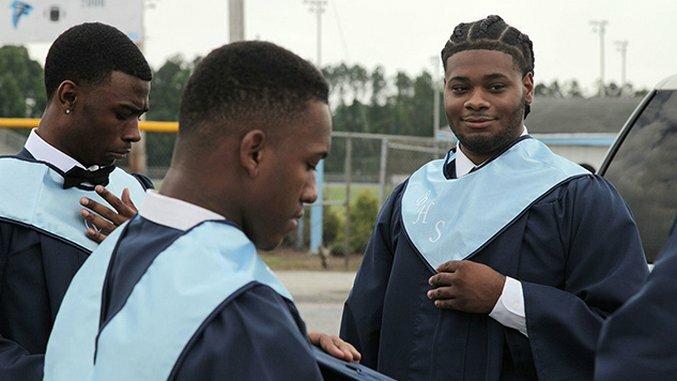 Shot over the course of six years in Bertie County, North Carolina, the film centers around the growth of three teenage boys—David “Bud” Perry, Reginald “Junior” Askew and Davonte “Dada” Harrell—with the years condensed into a brisk 90 minutes. The audience experiences a developmental panorama of the protagonists, watching them go from dealing with school to seeking good work and fulfillment. No matter their milieu, they’re beset by issues of systemic inequality and poverty. Despite the dry cinematic implications of “issues of systemic inequality and poverty,” Raising Bertie is the kind of movie that understands the intrinsic link between the political and the personal. It resists bombarding the viewer with infographics and statistics, intuiting that the lived experiences of these young men are more than enough to educate. True, interviewed adults speak about social machinations more than one might expect them to organically, but that’s simply because the community leaders and educators of this film have learned these topics as a daily matter of course. The film seems to assert that people who chafe at anything getting “too political” are often speaking from a position in which thinking about politics is a luxury. Many citizens of Bertie County don’t have such a luxury. The county is very poor—and, not coincidentally, very black. Bud, Junior and Dada’s growing pains (dealing with heartache, grades, their parents, fights) are exacerbated by a system that fails to support them. The “plot,” such as it is, hinges on a major upheaval in the boy’s lives in the first act, when their alternative school, The Hive, is closed by the county board of education and they have to return to the local high schools. The contrast is sharp; where The Hive was run by attentive administrators, high school life looks cold and hostile. This is a preamble to the last phase of the film, which takes place after graduation, when all of life is laid out before these young men, but there’s more confusion and foreboding awaiting them than hope and promise. Director Margaret Byrne was well-trained for this project by her work as a cinematographer and editor on 2013’s American Promise, which followed two black boys through the entire course of their schooling, over 13 years. Byrne demonstrates excellent control over the lens, with the film staying at a respectful but observant remove over the events. So too does it skillfully weave a narrative through line around the leads’ coming of age out of the six years of material. The progression of the timeline isn’t always clear (it’s sometimes ambiguous whether a month or a year goes by between scenes), but the film’s emphasis on character holds it together over such bumps. Raising Bertie is a moving chronicle, and a potent treatise on institutional failings that knows to demonstrate said problems instead of merely preaching them.